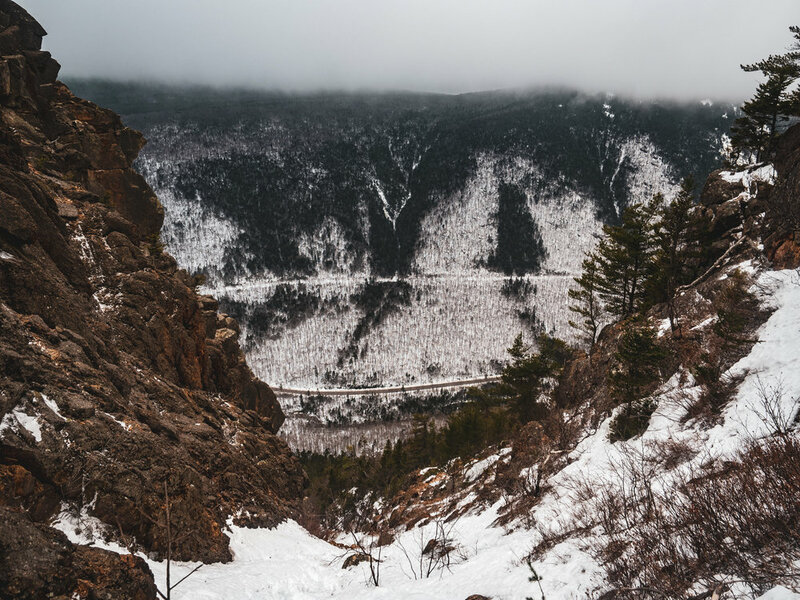 The trip started with a 14 hour drive to Massachusetts, (stay in a hotel thanks to my parents) and a three and a half hour drive to get myself into the Pinkham Notch Visitor’s Center Trailhead. It was here I met Joe, and we had an objective to climb Pinnacle Gully. 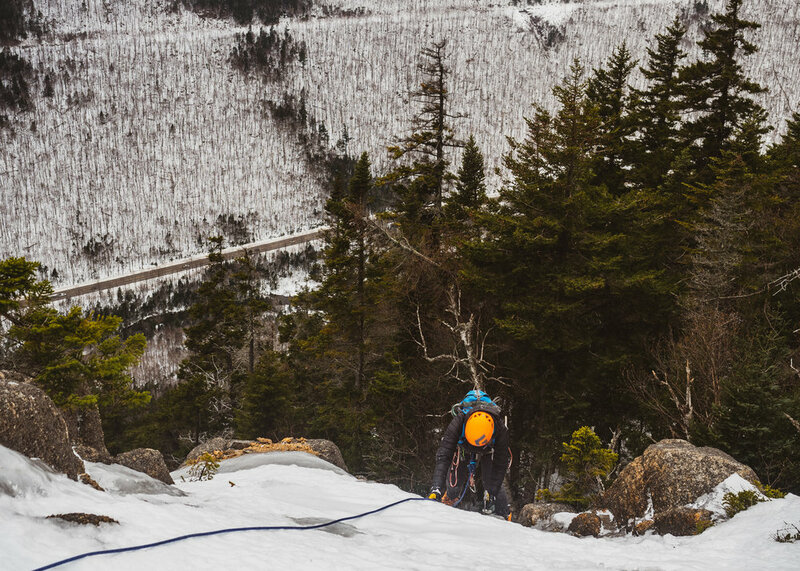 Joe has been climbing ice for almost 30 years, and has tons of experience from living out west and in New Hampshire. 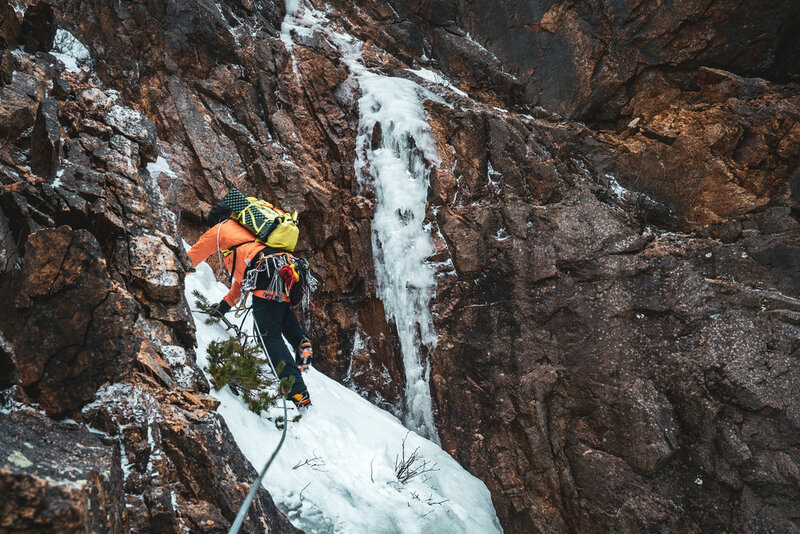 However, despite a long career as a climber he’d never ticked off the classic Pinnacle Gully. That would be our objective for the day. Route from Day 1. Pinnacle Gully is about where the climber icon is. We met, gathered our gear and started the hike up to Huntington ravine. We knew there were a bunch of parties headed up there, so we were going to take a leisurely pace. Instead we ended up going quite fast and got to the bottom of the ravine in just under 2 hours. The sun was bright, the sky was blue and there wasn’t any wind. The conditions were absolutely stellar. There was already one party on route and another party waiting at the base to start. A group of two who was just in front of us decided to take a different way up rather than wait in line. We hunkered down, drank some water, ate food and were set on making our ascent of pinnacle. With the warm and windless conditions the only thing we were fighting was patience. After a few hours of waiting we charged up the route. I gracefully led the first pitch of WI2+/3-, marking my first pitch of ice on the 18/19 ice season! I ran the rope up to the belay station on the left and brought Joe up. With the next part of the gully being mainly easy snow climbing with some low angle ice we decided to simul climb, (where both partners climb simultaneously with their weight being the belay), and cruised on up to the top. By the top we had our headlamps on and were gazing up at the stars as we crested over the ridge. We made a quick and easy descent back down to the visitor’s center and headed our separate ways. I went to the bunkhouse to check in and get some sleep for that night. The next day I woke up to find about 3 inches of new snow, with more sleet and rain to follow. I wasn’t sure about what my climbing partner was going to do for the day so I went to a diner for breakfast to await a response. My partner decided to pass with the ever changing weather, so I came up with a plan. I got a half price lift ticket to Black Mountain from the Sunrise Shack, and was eager to put some miles on my new skis. The runs were exciting with new snow and I was flying down the slopes like a little kid who had too much chocolate.. As predicted, snow turned to sleet which gave way to rain. A little after noon I decided to see if someone could help me out with the pain I had been feeling in my ski boots. As it would turn out Andrew Drummond (Mr. TuckerMan himself) was in his Ski the Whites shop and helped me out, to comfortable fitting boots. I toured North Conway, did a little shopping, stopped in on the ski museum, and had a nice leisurely afternoon. I decided to participate in the Ski the Whites race at Black mountain that evening and went back over to the mountain for some more sking. This time, uphill and under the glow of my headlamp. Instead of racing, I just took a couple laps around the course and heckled people at the top. It was amazing to see the speedsters transition from uphill to downhill with speed and grace. On Saturday morning I met up with Mark to climb Shoestring Gully. Shoestring Gully is a longer 1000+ foot climb/scramble on Mt. Webster, in Crawford Notch State Park.. We proceeded up the gully past water running down the stream bed. It seemed as if not much was frozen and we were wondering how the conditions would look as we went ever higher up the gully. Luckily for us, things did change. The water turned to ice and provided the perfect playground. The rock walls climbed higher and higher around us engulfing us in the mountain. Wind howled over the tree tops as it sputtered a mix of snow and sleet down onto us. Sometimes the wind would whip down the gully and pelt us with powerful gusts as we were climbing. A log jam happened at the start of the technical climbing. With 4 or 5 parties on route, we ended up waiting a bit for people to get through and clear out. Mark let me take the lead for the crux pitch and I danced my way up the ice. Most of the climbing was WI2/3. I had opted for a short 10 foot vertical pillar on the side of the gully for a bit more challenge. I set the belay with a mix of nuts and offsets, hoping for a refuge from the wind. Alas, it was not, and the wind had its way with me when it roared through the chute. I brought Mark up and he jumped straight into the next pitch. From here the gully was mostly a snow climb, with firmer snow near the top. Multiple parties were topping out via various alternate finishes, so as opposed to waiting we followed the gully up as far as we could and took an interesting ice finish to gain the ridge. From there you could see the view and the flanks of Mt. Willey through the clouds in the distance. After a few miles back down the trail we were back at the car wrapping up a fantastic day in the mountains. Mark was unable to climb again on Sunday, but I was able to find another new face named Dallas. Our plan was to climb at Frankenstein and do some harder routes. 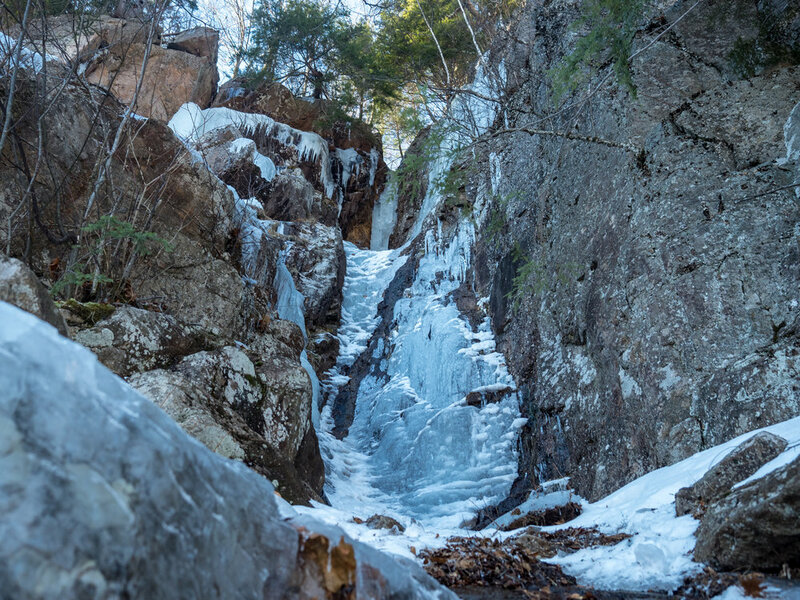 I really enjoyed the gullies the past two outings, but wanted some vertical ice to try out my new x-dreams. First stop was in the amphitheater. Chia didn’t look like it was in any condition that I wanted to lead it and neither did pegasus, but I had heard someone did Hobbit Couloir the day prior. I took a look at it and decided I didn’t want to lead it, but I definitely wanted to top rope it. We set up a rope and rapped down into the couloir. the start was on 5-6 feet of mixed rock and ice, leading to some running water and some solid ice on the left. Next, you pulled over a bulge and stood staring at the main column coming down. It was about a foot and a half in width, 20-30 feet tall, and steep.. There was some rock guarding the ice, allowing you to use a combination of stemming off of the ice and rock. It was such a great climb. It was steep, delicate, and mixed when we climbed it. We tried to look for the top of smear, to set a top rope up on, however, we were unsuccessful, so we rapped down and walked over to the base of the climb. I stood looking at it. Soon enough, Dallas breaks the silence, “So.. What do you think? Are you going to lead it? !” A few moments pass as I continue studying the wall of ice in front of us. I look down. “Yeah! Toss me the rope!” I exclaim. In my head I wasn’t 100%. It’s definitely not the mindset to have when leading ice. I told Dallas, if I got up to the top of the bulge and I wasn’t feeling it I would just down climb, and it’d be alright. All racked up now, the big, fat, lower pillar loomed over me. I swung my new x-dreams hard. It was beautiful virgin ice. I made my way up and put in a screw. Still feeling a little nervous and unsure, I pause. Dallas asks what I’m thinking. I tell him I don’t think it’s my day to lead it and stand there for another 20-30 seconds contemplating my next move. I swing my tool. Move my feet up. I’m already almost at the bulge. The next screw goes in easy at my waist and after a few more swings I’m pulling the bulge. I overcame that mental hurdle. Now I scramble up 20 feet or so to the base of the main headwall. There was water gushing down the ice next to me. As I start climbing the next bulge I’m taking close looks at the ice i’m climbing up. The ice is softer and more saturated up here with not much behind it. I peered over the next bulge and the ice looked delaminated and flakey. I decided I’d rather not chance it, especially with the more fragile looking ice towards the top. After down climbing the second bulge I made an anchor, brought Dallas up, and we rappelled off of my first ever V-Thread. It was exciting and nerve racking all at the same time. It was time to head down the train tracks. Our goal was to climb Dracula, a beautiful looking line, but there was a big party at the base and they had ropes all over the climb. Being the scrappy climbers we are, I decided to lead a less than beautiful looking route to the right of Dracula. It featured a mixture of brush climbing, steep bulges, crappy ice and hidden treasures. I had definitely underestimated the length and difficulty of the route from the ground. I thought we were going to just run right up the climb. However, what we couldn’t see from the ground were tricky slab sections and bullet hard ice at the top. It took me a good bit to reach the mossy top out. I was drenched in sweat when I finally pulled my body over the lip and into the trees. I brought Dallas up and he thought it was a solid 4/4+ line. We rappelled down and headed out for the day, ending the last full day of my trip. I stayed in the Northeast Mountaineering Bunkhouse during my stay which was fantastic, because it allowed me to hang out with like minded people, and get beta on routes and conditions. 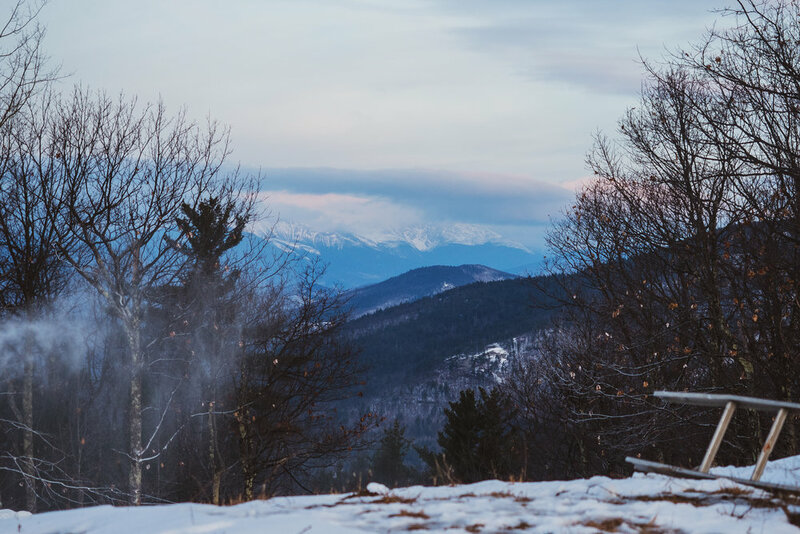 I convinced another guy from the bunkhouse to come with me and we did a sunrise ski up Cranmore mountain just outside of North Conway. It was a fantastic morning with cool, but not cold temperatures. The groomers did a wicked job and had a nice soft corduroy groomed for our long descent. Following the ski, I stopped and had a quick breakfast before driving to Boston, and visiting friends. Overall, it was a magnificent trip. I got to do a ton of vertical gain hiking, to train my legs a bit for the Katahdin trip in February. I also accomplished a fair amount of gully and steep ice climbing as well as more laps skiing than I thought I would. During this trip I met even more people than I have in the past and I’m already looking forward to seeing them, same time, same place next year. It’s remarkable what you can learn and accomplish when you listen, share your stories, or a rope with random strangers.